Chances are that you are sharing an Excel worksheet with a whole lot of calculations in it with a colleague. There may be instances when cell values need further explanation for better understanding. For example, it will make more sense to your colleague, if you added an explanation about a formula that you used or certain hidden calculations. Adding comments in a cell is a great way to do this. You can also add reminders, notes, pictures and more using the comments feature. 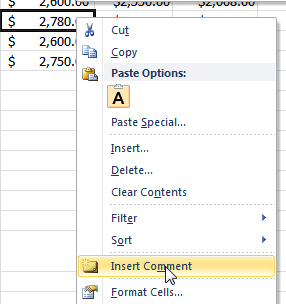 In this post, I will explain a couple of quick ways to add comments to Excel cells to share those tiny pieces of invaluable information and then format it to make it more attractive. 1. Select a cell and on the Review tab, in the Comments group, click New Comment. 2. The comment box is displayed. 3. Enter the desired comment and click outside the cell. 1. Right-click the cell you want to insert the comment and from the shortcut menu choose Insert Comment. 2. The comment box is displayed. Enter the desired comment and click outside the cell. A small red triangle in the upper-right corner of the cell indicates that the cells have a comment. To display the comment, just hover the mouse pointer over a cell that contains a comment. 2. Display the comment in Edit mode. On the Review tab, in the Comments group, click Edit Comment. Right-click the comment and choose Edit Comment. 3. Format the comment text and comment border. a. 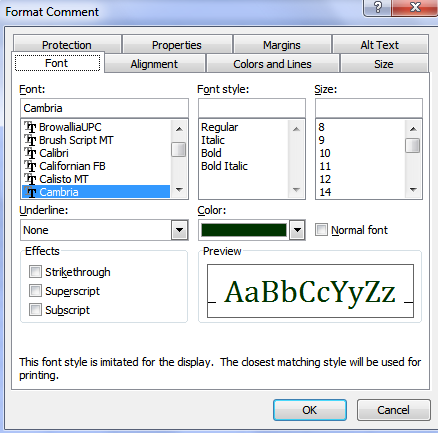 Select a font formatting option such as Bold, Italics, or Underline. b. Apply a font and font size using the Font and Font Size drop-down lists. c. Increase or decrease the font size using the Increase Font Size and Decrease Font Size buttons. On the Home tab, in the Alignment group, set an alignment option. a. Select the Font tab and set an option to modify the font. b. Select the Alignment tab to set an alignment option. c. Select Colors and Lines to format the background color and borders of the comment box. d. Select the Size tab to set the size of the comment box. e. Select the Margins tab to set the internal margins of the comment box. 4. If necessary, close the Format Comment dialog box. Given below are a few comments that I formatted. You can apply a combination of options to select one that suits your data the best.